This is YOUR story! This is the story about how you came into the world and changed it forever. Your story began out of such amazing anticipation and excitement. The time leading up to the possibility of your existence was challenging, making the news of your impending arrival all the more sweet and incredible. You were prayed for by your whole family even while they were just dreaming of the hope of you and I know that will continue throughout your life. Because your mom developed Gestational Diabetes during her pregnancy with you, not only were the doctors closely monitoring her and her sugar levels, they were also closely monitoring your growth. 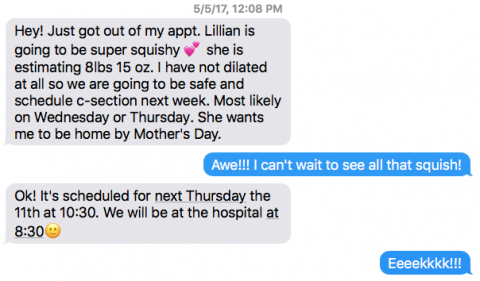 Below is the text update that I got from your mom just after her May 5th doctor’s appointment. Your birth day was hand picked, and just 6 days before your estimated due date you would join the world after what felt like such a long wait! Your parents were expected to arrive at Orange Park Medical Center at 8:30 am on Thursday, May 11th. They were met there by your personal cheer squad: both sets of grandparents and your Auntie Nikki. 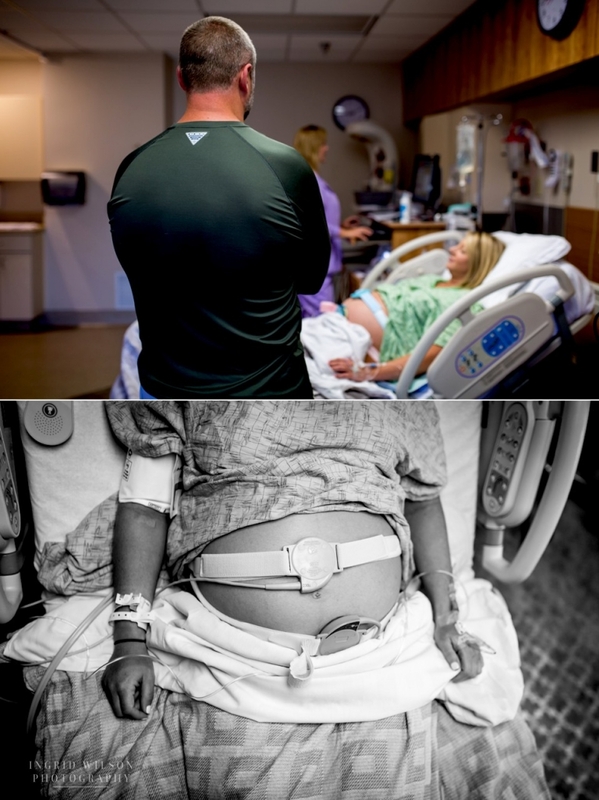 They shared a few sweet words of encouragement, some laughter, and some powerful words of prayer for safety and protection over you and your mama during your delivery. Once all the hugs were given and a few tears were shed over the magnitude of what was to come, your parents walked through the doors of the maternity floor as a couple for the last time, for the next time they passed through those doors they would officially be parents and YOU would be with them- going home as a family! Time seemed to tick away slowly in the triage room where the sweet nurse did all necessary to ready your mom and dad for your delivery. During their wait they joked about your sentimental grandmas and even asked if your pup-sisters could come and meet you in the hospital, all the while the steady gallop of your heartbeat filled the room. A few last guesses were made about how big you might be: your dad guessed a healthy 9.6 lbs. and your mom guessed just a little less at 9.3 lbs. (I actually guessed the closest at 8.9 lbs. HA!). After the OB and anesthesiologist visited to share information and answer any questions, your mom would endure one last finger prick before it was time to head to the OR. Unfortunately you would pick up that icky task once you arrived with heal pricks after eating for the first 24 hours to check your sugar levels. Your dad got all suited up and ready to go, opting to wear his flip flops beneath his shoe covers. It was a little later than originally planned, but at 11:11 am your mom was being wheeled into the OR- within a few short minutes you would be earthside! 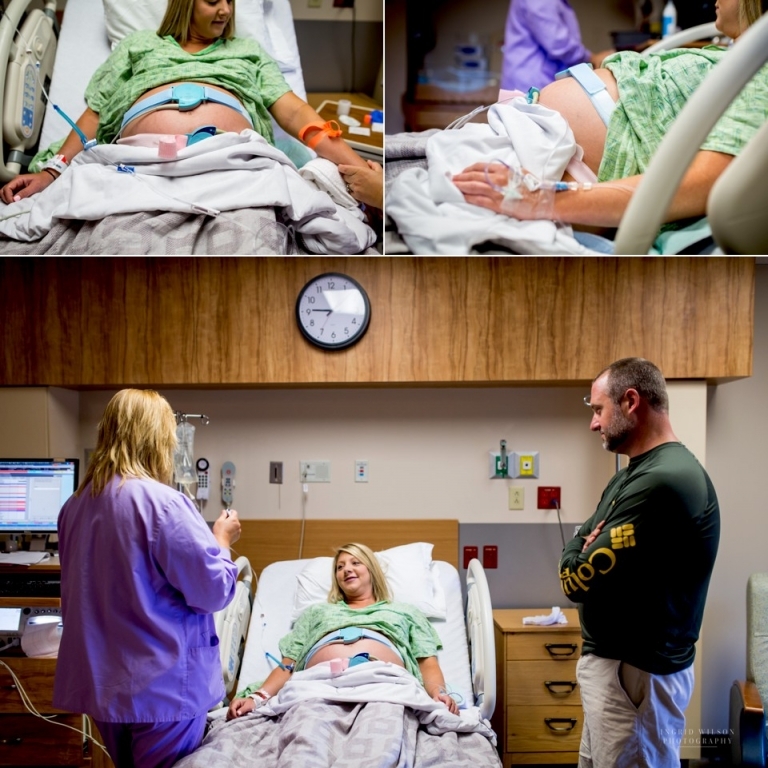 From that moment- your dad took over as the documenter of your arrival and captured these amazing pictures of you coming out of your mommy’s belly- the first peek at your adorably beautiful face! It was exactly 11:39 am. After a quick once over from the baby nurses, you were soon wrapped up and brought to your mommy so she could check out all 8 lbs. and 7 oz. of you. Your cheeks definitely contained plenty of “squishy” to love and kiss on. Sadly, there was a short period of time when your mom stayed in the OR by herself as the doctors finished tending to her and you were followed closely by your doting daddy to the recovery room where you were poked and prodded and checked over again. All the while your daddy was right by your side marveling at you, holding your hand, comforting you, and anxiously waiting to take you back to see your mommy. You measured 20 inches long and practically perfect in every way. Your perfect pink coloring turned even pinker when that mean old nurse gave you your very first vaccine. You clung tightly to your daddy’s finger the whole time and soon were comforted again. You loved sucking on your fingers from the very start and you comforted yourself until you could finally eat for the first time. Though your daddy didn’t get to cut the cord in the OR, he did get to trim it. At about 12:30 pm your mom was brought into her recovery room and you and your daddy were able to meet her there. Even though she wasn’t feeling quite so wonderful in those early moments after her surgery she was totally overwhelmed by you and your adorableness. The nurse helped her out with some fluids and soon you were able to have your first feeding at 12:40. The heal pricks began and your numbers were great. 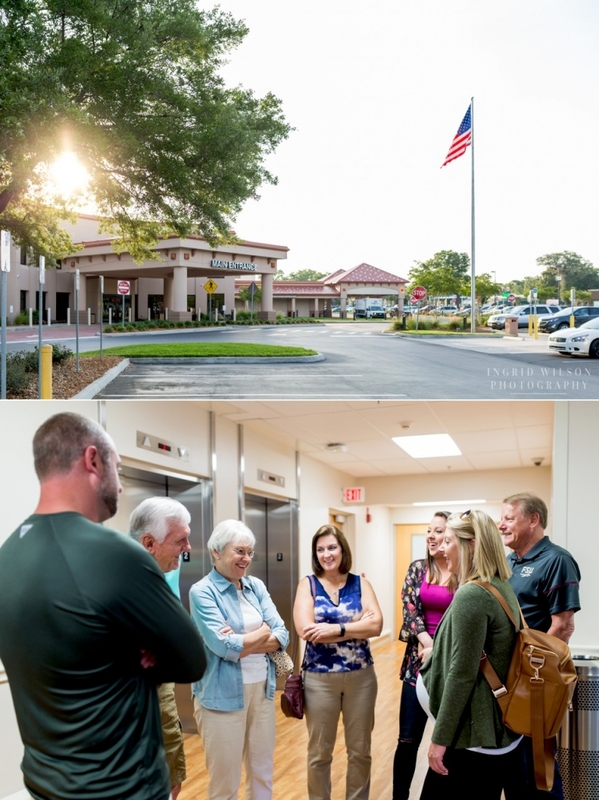 Just after 2 pm your family got to move into the cozy recovery room where you would get to meet all your grandparents and other visitors who had been anxiously awaiting you all day. For the most part you were perfectly content and happy to be snuggled up, but this is a cute example of how quickly you could change your mind. You definitely didn’t like to be unwrapped to have your diaper changed even though your daddy was a pro from the get-go. He could tuck your arms in the swaddle so you were snug as a bug. After their short visit, all the family and friends dispersed to give your mommy and daddy some quiet snuggle time with you. They turned the lights down low and all of a sudden your eyes popped open.